NEW MOON, I SAW YOU ORBIT ALONE Of 12 newly discovered Jovian moons (illustrated in bold orange, blue and green), one orbits in the opposite direction of its neighbors (arrows show orbit direction). Four moons discovered by Galileo are also shown (purple). Astronomers just found 12 more moons around Jupiter, and one is really weird. While 11 orbit in the same direction as their nearest neighbors, one doesn’t, potentially putting it on a fatal collision course. “It’s driving down the highway on the wrong side of the road,” says planetary scientist Scott Sheppard of the Carnegie Institution for Science in Washington, D.C.
Sheppard and colleagues found the moons while looking for something else entirely: a putative planet that could exist beyond the orbit of Neptune, known colloquially as Planet Nine (SN: 7/23/16, p. 7). During a survey in 2017 of the most distant objects in the solar system using the Victor Blanco 4-meter telescope in Chile, Jupiter happened to be visible in the same area of sky that the team was searching during one of its observing runs. “Might as well kill two birds with one stone,” Sheppard thought. The researchers found a dozen objects moving around the sun at the same rate as Jupiter. 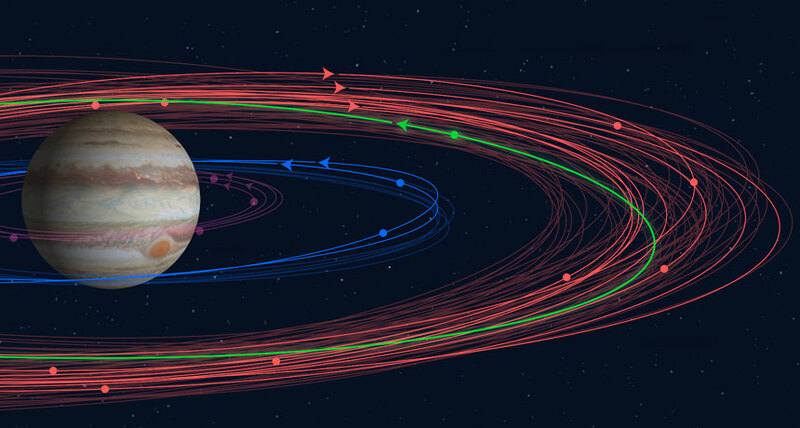 Follow-up observations confirmed the moons’ existence and orbits: two inner moons that orbit in the same direction that Jupiter spins, nine outer moons that orbit the planet in the opposite direction and one oddball traveler. For all but the last one, these motions are normal for Jovian moons, which now number a whopping 79. Scientists think that’s because the inner moons formed from a disk of gas and dust that orbited the giant planet in the solar system’s early days, similar to how the planets formed around the sun (SN: 5/12/18, p. 28). The outer moons were probably free-floating space rocks captured when they came too close, and their opposite orbit was set by the direction that they approached Jupiter from. But one moon broke the mold. This rock, which the team calls Valetudo for the Roman goddess of health and hygiene, is tiny, only about a kilometer across. It orbits in the same direction as Jupiter’s spin, but alongside the farther-out retrograde moons. As a result, Valetudo is probably doomed to collide with one or more of the other moons someday. The researchers are still calculating when, but they expect it to occur sometime between 100 million and a billion years from now. Valetudo may be the last remnant of a bigger object that has already withstood several collisions, or of a family of moons that has since been smashed to smithereens. “It’s probably the largest surviving member, if not the only one,” Sheppard says. Such nonconformist satellites are not rare, notes planetary scientist David Jewitt of UCLA, who was not involved in the new work. “But they are very interesting, because we know that they have been captured by their host planets, but we don't know how, or from where,” he says. Figuring out what oddballs like Valetudo are made of could help nail those details down.